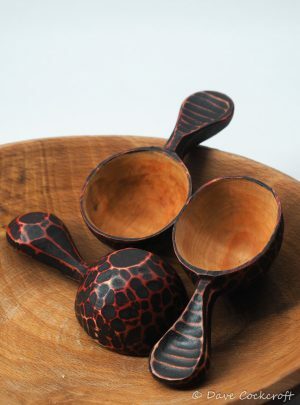 Scoops for measuring, like to live in your coffee caddy but are also partial for taking a wee medicinal nip of whiskey. 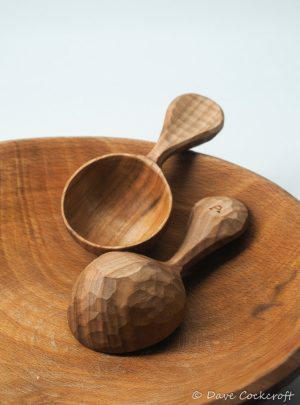 A alder scoop that’s like a mini kuksa. 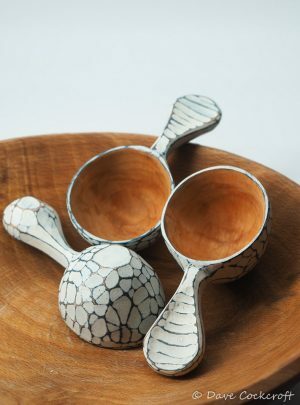 It sits slightly laid back on its base and the bottom of the handle. It’s equally at home living in your coffe caddy or displayed on a kitchen shelf. The measure if pretty close to a table spoon. It’s a wee thing but just big enough for a medicinal nip of whisky if you should choose. I don’t recommend using for hot drinks – it might be fine but I’ve not done extensive testing and too many expresso may become a problem. Please note the blue and white version is called seascoop and you’ll find that elsewhere on this website. This blue and white version is a companion to the seaspoon and insired by ripples on the beach and in the sea at Llangrannog in Cardigan Bay.